Only ecological innovations will move the world towards a green economy. We need innovations to produce, in a more-eco-friendly way, what the planet offers its rapidly increasing population and to use these offerings more intelligently and on more than one occasion. We need technical, process- related, social and political innovations that enable system change. Only the accelerated use of innovations can – in these times of change, when record greenhouse gas emission levels are being reported and all across the globe a departure from fossil fuels in thoughts and deeds has arrived – successfully limit progressive climate change. Only in this way will we succeed in decoupling CO2 emissions and resource consumption from economic activity in the long run. How, in the Year of Science 2012 – “Future Project Earth” announced by the Federal Ministry of Education and Research, can the course be set in science policy? How do we create truly relevant knowledge? 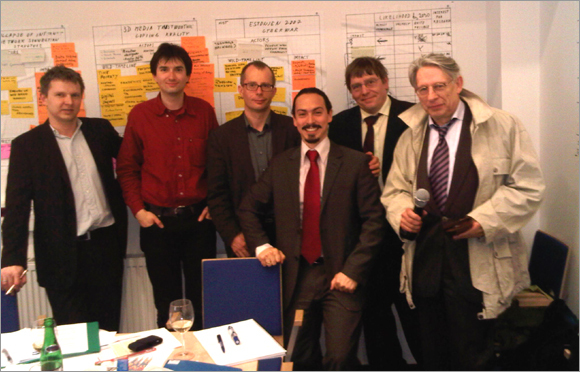 What can be the innovation accelerators for production in various sectors of the Euro- pean economy? Which ones are needed for global agriculture, energy supply, urban development and mobility, and what form should an innovative science, research and economic policy take for it to fuel innovations and release the potential of a creative society? Against the backdrop of the challenges, this conference will enable a critical appraisal of the status quo and provide compelling insights into new production processes, into technological and social innovations as well as process innovations, into trends and research findings on the horizon as well as information on unresolved, urgent tasks and research projects. 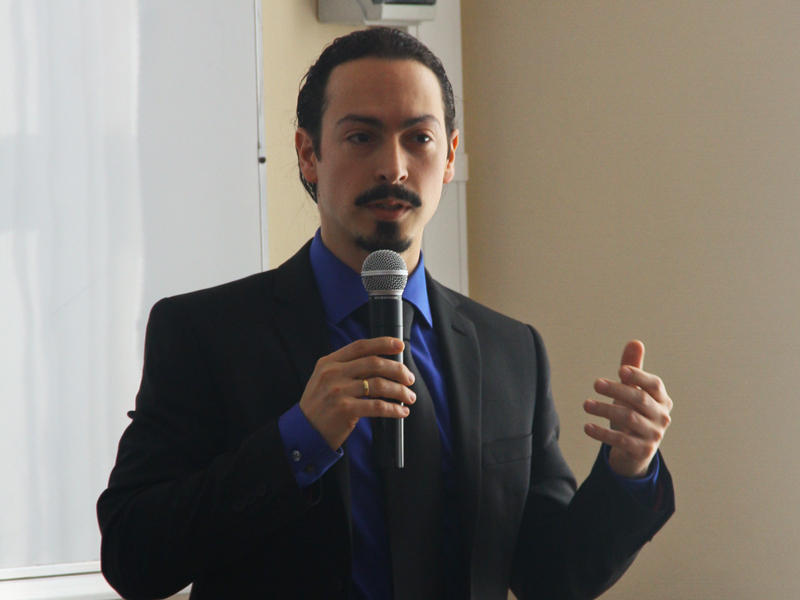 The presentation was part of Session One on “Science and Technology Foresight in Russia”. The session was attended by over 200 people and moderated by Dr. Dirk Meissner. Other presentations of the session included: “S&T Foresight and its Place in Russian S&T Policy” by Prof. Leonid Gokhberg; and “S&T Foresight: Methods and Organisation” by Prof. Alexander Sokolov. The session discussant was Dr Oleg Karasev. The Czech Technology Centre of the Academy of Sciences and the University of Manchester organised an interactive workshop in Prague on 29th and 30th March 2010. The workshop is part of the iKNOW project’s activities aimed to discuss the impact of unexpected events on European research and development (R&D) and look at the implications this may have on future R&D priorities, innovation, growth and sustainability. The workshop focused on surprising events (e.g. wild cards) and emerging issues (including weak signals) with four groups looking at three overlapping themes: Information and Communication Technologies, Security and Nuclear Research. Twenty wild card situations were discussed during the first day of the workshop. The “Mapping Foresight” report is part of a series of publications produced by the European Foresight Monitoring Network (EFMN project, 2004-2008). The mapping activity was one of the main activities of the network. Over 2000 initiatives were mapped between 2004 and 2008 in Europe and other world regions, including Latin America, North America, Asia and Oceania. The report is the result of the first large international effort aimed at understanding the nature of foresight practices. Foresight has become more than just a tool to support policy or strategy development in Science, Technology, and Innovation (STI). Foresight practice is the result of a systematic work to promote effective processes to proactively think about the future. These processes can be applied to a variety of research areas or knowledge domains, such as natural sciences, medical sciences, engineering and technology, agricultural sciences, social sciences, and the humanities. Strategic Shocks were the theme of the FAN Club’s October 14 meeting. 67 people found their way to the Rutherford Appleton Laboratory, part of the Science and Technology Facilities Council and one of Europe’s premier science centres, to hear about them in a packed and highly varied programme of talks. Brian Brader of the Foresight Horizon Scanning Centre began the day by discussing some recent British shocks that have disrupted the system in one way or another. His examples were flooding in 2008, the 2005 Buncefield fire and the subsequent disruption of aviation fuel supplies, and the 2009 parliamentary expenses scandal, a big disruption to the democratic system. But alongside these rapid shocks are slower ones, such as climate change, epidemics and terrorism. These are harder to spot. We tend to like information that confirms our view of the world rather than challenging it. 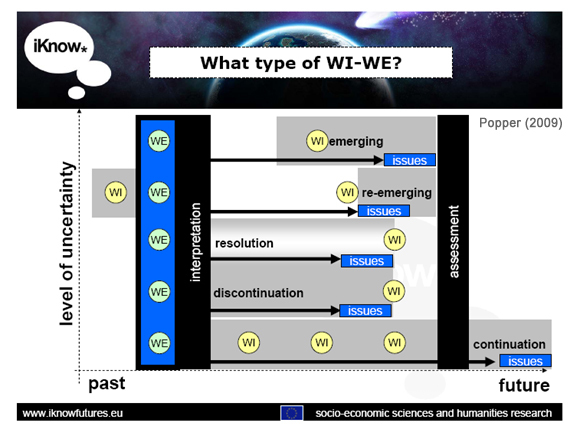 Rafael Popper discussed an EU project on wild cards and weak signals which forms part of the Framework 7 research programme and which is intended to help shape future science priorities. The aim is to produce a more interactive version of the Sigma Scan. Wild cards, he said, are one of the least understood areas of future studies. We need to know more about where to find them and how to classify them. Asking about them at conferences, in surveys and by other methods has revealed the need for some consistent process. Asking an open question about them produces a large amount of unclassifiable material, but the policy makers need something usable and structured. Better structure also allows us to make sense of the wide variety of responses that come back if we ask different audiences – maybe the public, artists, scientists and civil servants – for their views. The project has built up a list of over 70 wild cards and over 80 weak signals which need to be classified. How we do this and at what stage in a project is a question Rafael aims to answer. One approach is to divide wild cards into those that tell us that the future will be like the present, and others that suggest it will not. Gradual climate change effects, or a war in Europe, might be in the first group, and severe oil shortages, or a shift to renewables, in the second. The most difficult wild card to build into any idea of the future is one that has a totally new technology or paradigm. Rafael urged us to avoid too many ideas about “good” and “bad” change. As he said, the extinction of the dinosaurs was bad for them but ideal for us. Terrorists might regard an attack as a success. More ambiguous are ideas like genetic engineering. We might want to wipe out genetic defects, but what about reengineering babies so they don’t commit crime? That idea certainly emerges in the science fiction literature. From wild cards, Rafael moved on to weak signals, which he describes as “observable warnings that implore us to consider new interpretations of issues.” An example is the former US plan for an anti-missile system based in Poland and the Czech Republic. The US regarded it as an investment in threat reduction, but Russia, Iran and the UK all had their own views of its meaning. In the end these rival views led to its cancellation. Its cancellation is in turn a signal about the Obama administration’s policy intentions. Continuing on this theme, Rafael mentioned President Obama’s Nobel Peace Prize – a wild card open to a massive number of interpretations. On their hunt for wild cards and weak signals, Rafael and his colleagues have scanned over 3000 EU projects before moving on to magazines, journals, blogs and the Sigma Scan. Now they are having workshops with a wide range of experts working on major global issues to find out what breakthrough in their area would help most to solve their problem. The plan is to have a bulletin on the 50 top issues after the present analytical stage. There will also be an online tag cloud of key words and terms, the iKnow Oracle, which people can use like a Wiki version of the Sigma Scan to get at the issues. See Rafael’s PDF presentation here and the iKNOW website here. This report presents a rationale for a European Research Area that has a clear purpose which is meaningful to Europe’s citizens and political leaders and relevant to its key actors. While there is a pressing need to improve the effectiveness of the public research system, the ultimate justification of the resources and commitment needed to achieve this lies in increasing the value of the contribution that public and private sector research makes, and is seen to make, to Europe’s economic, social and environmental goals. The central means to achieve this is to engage the research system in Europe’s response to a series of Grand Challenges which depend upon research but which also involve actions to ensure innovation and the development of markets and/or public service environments. Challenges may be rooted in economic, social or scientific goals but share a need to demonstrate their relevance at the European level, their feasibility in terms of Europe’s capability to engage with them, and a clear research dimension such that they gain the commitment of the research community and pull-through the necessary improvements in its efficiency and effectiveness.